For instance, the near-perfect climate is one of the main reasons as many as 12,000 expats now call the town and district of Boquete home. Its elevation of 3,940 feet on the eastern slope of Baru Volcano means normally cool temperatures around 80 F in the daytime and 60 F at night, with frequent misty rain called bajareque. The village sits in a bowl-like depression, split by the rushing Caldera River. The surrounding hillsides are dotted with homes. Several loop roads head from town up into these communities and back down, so the area is interconnected and accessible. 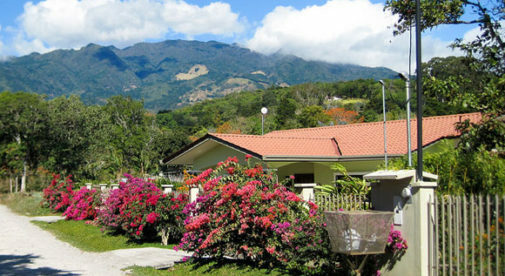 Boquete is known for its natural beauty and has an unexpected alpine quality. 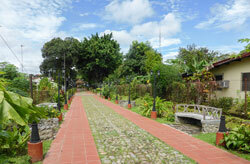 Also tucked into the hillsides among the exotic flowering plants are coffee plantations and orange groves. What really sets Boquete apart is the people of the community: a relaxed mix of Panamanians and indigenous, foreign expats from North America and Europe, and tourists and visitors from around the world. All this combined energy means there’s always something to do here. Then there’s Volcan, which shares the fresh highland climate of Boquete. I never get tired of the drive to Volcan. The highway that winds uphill is lined with dairy farms, plant nurseries, poultry barns, and spectacular vistas across the landscape. The town is in open country, spreading out toward the looming volcano in one direction, and the border with Costa Rica in the other. Beyond town the road climbs upward, past horse stables and mountain streams, to the village of Cerro Punta. Along the way vendors sell bags of their fresh produce and the local favorite, fresh strawberries with cream. Between the highlands surrounding the volcano and the lowlands along the coast lies a region I’m calling the midlands. This largely undeveloped and overlooked area stretches from west to east in the foothills below the volcano and consists of numerous small towns with a far-flung expat population. With a climate warmer and drier than the highlands and cooler and fresher than the lowlands, for some this is the perfect location. As for me, I live just north of the capital of Chiriquí province, David. My husband, Al, and I pay just $220 a month for rent here. David is Panama’s third largest city and it sprawls out west to east along the Pan-American Highway and south to the mangrove estuaries along the coast. David is a hive of activity. As the seat of government it is where official business takes place. Lying in the lowlands David is truly tropical and always hot, still, many of us manage with fans and no air conditioning. What draws expats to David is the convenience of having all you need just a few minutes away. I live five minutes from one of the nicest supermarkets in town, which sits in a large shopping center with a hardware store, department stores, electronics stores, a wine and liquor store, and more. For my own part, my husband Al and I spend around $1,400 a month and that includes our rent and medical expenses. David, Panama’s third largest city, has a low cost of living, tropical weather, and great health care. Our tour of Chiriquí Province ends at the shoreline and the Gulf of Chiriquí, which opens onto the Pacific Ocean. This coast is known for its fantastic offshore fishing, with tuna, marlin, mahimahi, sea bass, snapper, and more running in the local waters. The water is always warm so you can swim year-round. Numerous small islands and coral reefs are included in the Gulf of Chiriquí National Marine Park, most of them easily reached from Boca Chica where boats are for hire. You won’t see any high-rises, condo developments, theme parks, or water sports vendors. You will see a sandy beach with a wide tidal range, typically small waves, and very few people.